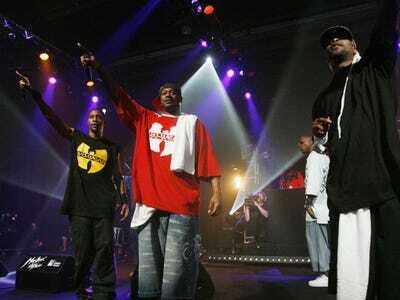 The Wu-Tang Clan is a hierarchy. In multiple interviews with the site Hip Hop DX ahead of the release of their new album, A Better Tomorrow, members of the rap group confirmed there’s a tiered system of payment within the group. It seems to have created some friction among members. The blurbs, from various video interviews, are summarized by Jay Balfour. It’s a system that was developed within our system to bring a certain status to individuals. That was the most stagnant part of the building and structuring of this album. We had to deal with that. Even until the last minute, brothers had to overcome our differences in order to make it work. But there’s still an upper tier. I don’t know if that’s gonna affect anything in our future plans, but that’s what it is. I think it came from a third party, one of our solo managers maybe. But when it penetrated I was like, ‘Yo, that really don’t make no sense.’ In that case just give me the most money … But as far as me going along with it, I was like, ‘Yo, I’ll put myself on a lower-tier and y’all could try it for a year if y’all want,’ … So, we actually tried it for a year and I think we’re gonna have to vote on that again. That has to be talked about. Wu’s membership is notoriously fluid (roughly ten members, but it has changed over the last two decades). Given the list of members in the upper tier named by Cappadonna, the lower tier would then probably include him, Inspectah Deck, Masta Killa, and U-God, according to the list of group members on the website.